Do you want to send password protected emails with an expiry date in Gmail? In this guide, we’ll tell you how to do this. 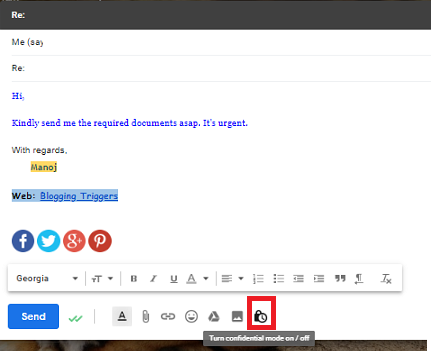 Google has recently redesigned Gmail’s web interface with a fresh look and smart features like confidential mode, smart replies, email nudging and priority notifications. 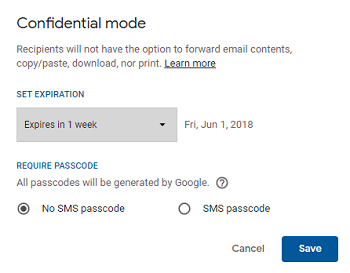 Confidential mode is the important new feature of Gmail. It lets you send emails with expiration period, two-factor authentication, and advanced privacy controls. Snpachat like messages will disappear from the recipient’s inbox when the time reaches. You can set the period for one day, one week or maximum 5 years. Here’s how it works. Compose your email as usual. Enter recipient email address, subject, contents and before hitting the Send button, tap the clock icon from the bottom panel. A popup box will open with additional settings. Set expiration when you’d like the email to expire. Choose SMS passcode option to lock the message and enable two-factor authentication for the email. Once you saved, another box will open where you need to enter the recipient’s mobile number. He/she can’t read the email without providing the passcode sent to their number. Click the Send button. 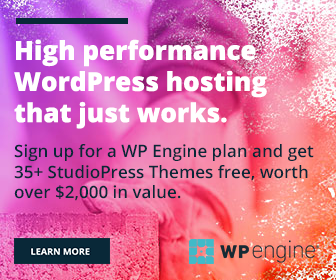 The other party will get the email with content expiration note and date on the bottom after which it will vanish from their inbox. Unlike regular emails, recipients can neither forward nor print these self-destructing emails. But as you know no one can prevent them from taking screenshots to save your message for future reference. If the recipient is not a Gmail user, he can’t read the message directly from the inbox. Instead of that, he will get this kind of message. He should click on the link and verify his identity to access the email contents. The email once sent is sent forever. But Confidential mode gives you more control over the messages. It allows you to recall an email anytime by going to the sent folder. Open the desired email that sent as confidential and click on “Remove access” to prevent the recipient from reading it. Now the option will change to “Renew access”. Click on it to make the email available again. Smart replies(to provide quick replies to the messages), email nudging (email reminder or follow-up) and priority notifications (for important messages) are other major changes that Google rolled out with the recent update.